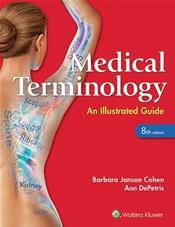 Now packed with new illustrations and more clinically relevant than ever before, this fully updated Eighth Edition of Medical Terminology: An Illustrated Guide helps readers develop a fundamental knowledge of the medical terminology necessary for a career in any health care setting. To help students learn both medical terms and how they are used in real-world settings, this reader-friendly book demonstrates how medical terms are built from word parts (Part 1), introduces body structures, diseases, and treatments (Part 2), and covers each body system (Part 3). Accessible content, a logical organization, and reinforcing drills in every chapter combine to help readers master the information they need for success in their future careers. An enhanced art program, many new, clinically focused case studies, and an improved online teaching and learning resources (including prepU adaptive quizzing) make this Eighth Edition ideal for classroom instruction, independent study, or distance learning.